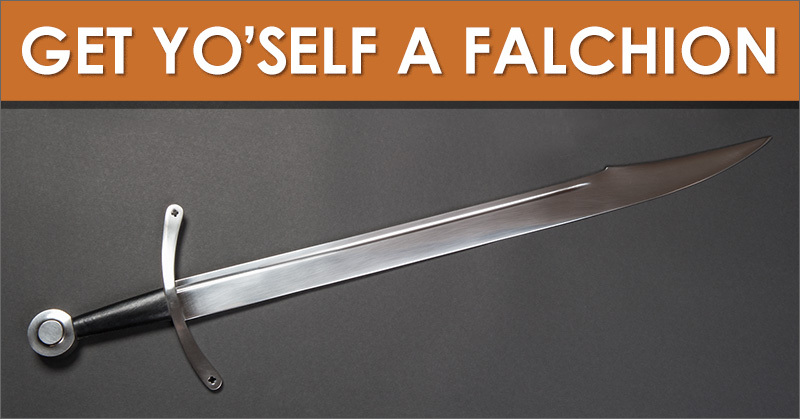 Posted: Wed 04 Nov, 2015 12:00 am Post subject: Contest: Get Yo'self a Falchion! Hey everybody it's that time for another world famous myArmoury.com giveaway. We enjoy giving away stuff as often as we can to let our community know we appreciate them. Every member is eligible for this contest. "Although its prevalence in Medieval art testifies to its popularity, very few original falchions still exist. This rarity of surviving specimens may be more proof of its popularity; most of the falchions were used up in battle! While the double-edged sword gets most of the press, the single-edged falchion was favored by a great many knights and men at arms. The wide cutting blade was quite effective against mail (although armor was being improved by the addition of plates, only the very wealthy could afford it). Although the falchion was intended primarily to be a cutting weapon, the development of the point was not ignored. This example has a very strong point that would penetrate mail with the hard thrust or stab. 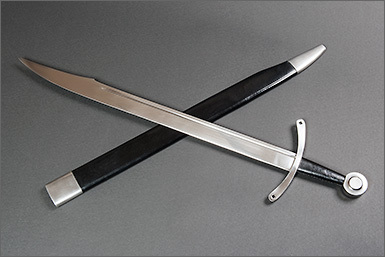 A well-designed fighting weapon made by Windlass Steelcrafts. 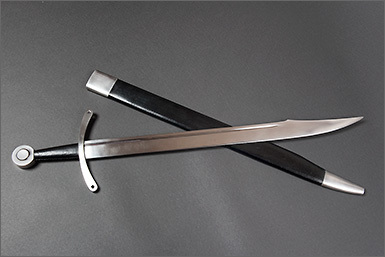 The blade is tempered high carbon steel, the guard and pommel are both steel and the grip is wood covered with leather. Complete with a leather scabbard." This contest is open to all myArmoury.com members. There is no twist. If you are a member of myArmoury.com, you can enter this contest. It's free and open to everyone. If the button says to click it to enter, just click it. If it doesn't say you can enter, it will let you know. Easy, right? Make sure you're logged-in before you try to enter. Contest entry is open until Monday Dec 14, 2015 at Midnight PST. All participants will be entered into a drawing and the winning names will be randomly selected later that same day. So, it seems the drawing for both the gladius and the falchion will be on my birthday - keeping my fingers crossed! Never tell me the odds!!!!! This contest entry period is over. The winner will be announced in the next 24 hours or so! !